There are powerful health benefits inherent in drinking vinegar. 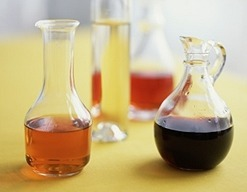 Vinegar has a marvelous history in health tonics of all types. In my first book, Apothecary Cocktails: Restoratives from Yesterday and Today, I discovered that mixing vinegar, fruit and sugar together is more than just a flavorful treat. What drinking vinegar does is certainly offer refreshment, but it goes much further than that! But first, what is a Shrub? It’s not one of those plants from the garden center. A Shrub is a concoction of at least three ingredients, with vinegar being the key component to preservation. Vinegar is especially good as a health tonic and aid to digestion as evidenced by Asian cultures. They have utilized sweet plum vinegar for thousands of years in the desire for long life and good digestive health. Asian plum vinegar is little more than sugar, vinegar and crushed plums. But mixed into a cup of iced Oolong Tea or woven into a savory dish, good health and long life seem to join in the fun of drinking this ancient Shrub. Shrubs are in vogue again because they taste good, mixed with, or without the intoxicating ingredients. But when did they become popular here? Place yourself into the mid 18th Century, the early days of our Colonial nation. Most of the food that you ate during the day was either produced fresh or it was suffering from some form of rot. The plain facts of life are without refrigeration; food goes bad, very quickly. Vinegar is a powerful preservative to fruit or vegetables and when taken in the form of a Shrub, it aids digestion! Enter the ever-enterprising immigrants during the 18th Century. These people brought the art and science of Shrubs with them from far-flung places in the world, where you ate food either freshly made, preserved in some manner, or not at all. This is harsh realty, but as anyone who has ever suffered from food poisoning knows, your food can hurt you, very badly. Something had to be done to extend the usability of fragile fruits through these ancient preservation techniques. This desire for refreshment forced the entrepreneurial spirit. The early residents were driven to create Shrubs using ingredients available at the time not only for refreshment, but also for overall good health. Bitters and tonics were widely available at this time in the mid 18th Century in the early apothecary shop or dispensed by “Snake Oil salesmen” out to make a quick buck. These techniques and materials were not originally used in cocktails. They were used for good health! The early apothecary would dispense bitters, tonics and vinegar based preparations for healing maladies in the gut. Shrubs were first used as healthy refreshment in early America in the absence of pure water sources. For decades, most water that people drank was poisonous because it had not been purified before drinking. Contrary to popular belief, you cannot just drink from the stream over there. What is living in the water will hurt you, badly-should you not purify it first. Wine was added to water, as were Shrubs to make it drinkable. A portion of the acidulated Shrub was added to a glass and cool water was poured over the concentrated syrup and then it was enjoyed. Remember, without refrigeration, there was no ice so the market was ripe for innovation in this regard! Around the same time, workers in the fields were introduced to another Shrub-like concoction that was the energy drink of the day. This drink was named the Haymaker’s Punch, a combination of vinegar, water and molasses or honey. This punch often had a bit of brandy, whiskey or rum added to make a potent energy drink. Fast forward to the days of soda pop. Entrepreneurs discovered that carbon dioxide gas and water mixed with cane sugar and fruit syrup was a pretty good way to stay refreshed. This was the death knelt to Shrubs that require a much longer time to extract the essential flavors. Shrubs take patience and time to achieve their concentration, thus making them more difficult (and expensive) to make in quantity. For the modern mixologist or the home-bartender, Shrubs stir up Colonial and pre-Colonial history in every sweet and tangy sip, offering real balance to craft cocktails. I like to do my Shrubs at cellar temperature, 50-55 degrees. I believe that I get better results than the ones I did in the refrigerator or even the heated ones. You may be squeamish about leaving a bowl of fruit, vegetables and sugar on your countertop, covered with cheesecloth, but you shouldn’t be. There really is nothing to fear about fermentation, after all we drink fermented beverages and they certainly are not pretty to look at in the early stages. Most of the Shrub recipes that I see in the news are sweet ones. I propose to do a savory Shrub for the Raw Honey based gin from Vermont, named Barr Hill. I think Barr Hill works the best for Shrubs because of the pure and natural ingredients inherent to the farms of this region of the country. The raw honey element adds much to my Shrub that contains early spring peas and mint. This savory Shrub is a gorgeous way to drink your body into deep relaxation, but what a healthy way to go! Let sit until the peas start releasing their inner sweetness and the sugar appears to melt into the peas… this make take a week or so, be patient, but stir twice daily with a wooden spoon to combine, you may want to stir more frequently… it’s up to you! Strain the mashed peas and mint out and add to a sterilized Mason jar. This will keep many months, but I’m sure you’ll drink it much sooner than later. The flavor and the color of the peas and the mint will mellow over time. To make this drink a MOCK-Tail.. leave out the gin, not sure why you would, but you never know, this may refresh you more than artificially flavored soda pop!